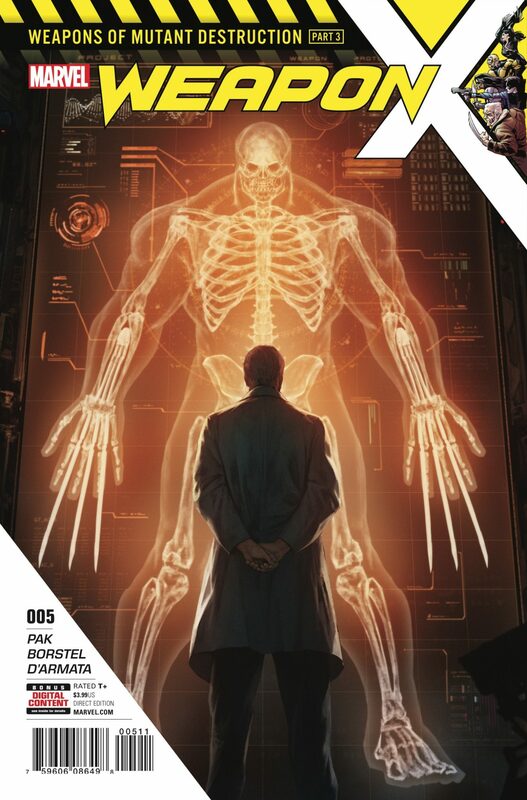 Weapon X #5 Review – AiPT! ‘Weapons of Mutant Destruction’ is an exciting series, but the third installment could be a do or die moment. Secret Empire may offer the most far reaching event series for Marvel right now, but if you ask me, the most entertaining is “Weapons of Mutant Destruction.” Greg Pak has been writing a highly entertaining, monster mash-style road trip story so far. It’s an event in and of itself, but on a smaller scale. Part 3 starts today! Read our preview to see and read more. Pak hasn’t forgotten the villain–or at least the organization who is doing all the villainy–which is an important aspect of any good story. So far he’s shown us the villains operate out of a peaceful suburb complete with kids running about and perfect American lifestyles. Well, except for the green vats filled with human test subjects beneath them! He’s made the villains multifaceted so they’re more compelling and complicated. This issue opens at the Serenity Hills location outside, where the families are living their perfect lives and pretending they aren’t performing horrific scientific experiments on innocent people. Pak pulls you into the story by showing a normal family dealing with a mouse. In a clever twist, that mouse comes back to haunt a new character that’s introduced who works below ground. To say this scene leads to a shocking moment is an understatement, and it helps plant the seeds of doubt and frustration the new character is feeling. This, in turn, pays off with the cliffhanger, which should spell complex villainy in future issues of this arc. The rest of the issue delivers what this series has been best at, and that’s detective work. Cho, Sabretooth, Wolverine, and Lady Deathstrike have been working together to track down the facility this issue opened with. Following some leads and using some brain power they get a bit closer but run into a hitch or two along the way. Pak drops a surprise twist of sorts and it weaves in beautifully with the new scientist character introduced at the start. It’s a cool way to tie the villains and heroes together too, since they’re so far apart. Fans of action shouldn’t dismay, as Marc Borstel drops a Domino/Warpath action scene right in the middle of the issue. The three page scene ends with a fantastic full page splash of the two heroes fighting off some awesome looking robots and enjoying every minute of it. In another great full page splash, Borstel draws a scene inside a cage where the new scientist character is performing a test. It’s dynamic as hell, with great detail on every single rat looking bottom-up, as if we are a rat looking on its prey. Jesus. Indiana Jones would hate this page. Scenes with Wolverine and Sabretooth are somewhat strange visually and it all starts with Wolverine’s face. He looks somewhat off, and awkward looking faces pop up throughout the book too. It has something to do with how the characters emote–they come off as somewhat robotic. In a scene with the scientist character there’s a coworker who is relishing doing evil things to the degree where his facial expressions are comically over the top. It’s the kind of thing that might go unnoticed if you’re not looking for it though. “Weapons of Mutant Destruction” is a page turner that’s highly entertaining. I recommend it wholeheartedly, especially after reading the third chapter as it’s very well written and plotted. Another great chapter in a very fun series.